Larry Sultan's photos capture, tenderly, the paradise of Southern California – and the tensions and desires that complicate it. You can smell the photographs of Larry Sultan. My wife noticed this before I did. She is a Western person (she grew up in Las Vegas). That’s to say, she’s a desert person, as am I (Los Angeles). So it makes sense that she could smell Sultan’s pictures. 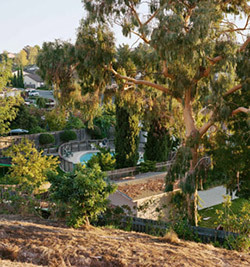 Most of the photographs of Larry Sultan (currently on display at LACMA’s retrospective Larry Sultan: Here and Home) are thick with the San Fernando Valley in North Los Angeles, where Sultan grew up. “Larry Sultan: Here and Home” at the Los Angeles Museum of Contemporary Art, Los Angeles. Through March 22.